The hardest working band of professionals at this year’s ERA New Horizons International Film Festival, which closes today in Wroclaw, Poland, are undoubtedly the juries that have been viewing films from all over the world in the main Festival competitions. As the Festival heads into its final days, they move from viewing and evaluating the films into the rigors of that favorite blood sport, championing their favorite titles and trying to reach concensus. The Festival has assembled a distinguished and diverse jury for the New Horizons International Competition. Lukasz Barczyk is a Polish director, producer and screenwriter whose latest film “Unmoved Mover” is playing in the New Polish Cinema competition. Joao Botelho is a Portugese screenwriter and director who is also the founder of the critical magazine M. Sebastian Lelio hails from Chile, where he has become a major film force. 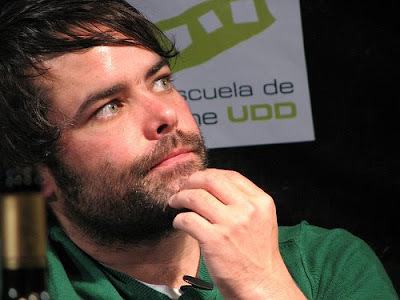 His latest film “Navidad” recently premiered at the Cannes Film Festival. After working in the theater and making short films, Peter Strickland has moved into feature filmmaking with his debut “Katalin Varga”, which premiered at the Berlin Film Festival. Leszek Wosiewicz is a Polish film, theater and television director who also serves as a mentor to young filmmakers at the Silesian University in Katowice. The jury assembled for the Films On Art International Competition come from diverse backgrounds. Katarzyna Kozyra is a Polish sculptor who also uses photography, video installations and performance art in her pieces. Marie Losier is a French film curator who has programmed series and events in New York, Berlin and Paris. The Hungarian Tibor Szemzo comes from the world of music but has incorporated video, installations and film experiments into his multi-disciplined work. New York-born Jay Weissberg is a film critic living in Rome. Ian White is the adjunct film curator at the Whitechapel Art Gallery in London, who is also a writer and freelance curator for other arts institutions. The New Polish Films Competition also brings together talented individuals from throughout Europe. Emily Atef is a German filmmaker who presented her films “Molly’s Way” and “The Stranger In Me” in previous ENH festivals. Michael Brooke is a curator of the British Film Institute’s National Archive and also one of the creators of Screenonline, the BFI’s multimedia encyclopedia. Marta Meszaros is an award-winning Hungarian director whose films feature strong feminist themes. Pawel Pawlikow is a Polish-born film director now residing in the UK, whose film “My Summer of Love” won the Alexander Korda Award for Best British Film. Miroljub Vuckovic is a Serbian journalist and producer who has been active in bringing international cinema to the former Yugoslavia.